New Delhi: Agni-V, India's newest strategic missile, on Thursday took its first successful flight and India joined a select club of nations with such technology. Agni-V's five thousand kilometer range puts all of Asia within reach plus much of the Indian Ocean, parts of Africa and Europe. "The successful launch of Agni-V missile is a tribute to the sophistication and the commitment to national causes by the scientific community of India. I hope that in years to come our scientists will contribute a lot more in defence and other walks of life." Strategic Analyst C Rajamohan said, "The prime objective is to have a nuclear deterrence against China. The Agni-V serves that purpose." Retd Air Vice Marshal Kapil Kak said, "We are now in a position where no one can mess with us and get away with it." one of the most important of the Vedic gods. He is the god of fire and the acceptor of sacrifices. The sacrifices made to Agni go to the deities because Agni is a messenger from and to the other gods. He is ever-young, because the fire is re-lit every day, and also immortal. Agni, the Vedic god of fire, has two heads, one marks immortality and the other marks an unknown symbol of life has made the transition into the Hindu pantheon of gods, without losing his importance. 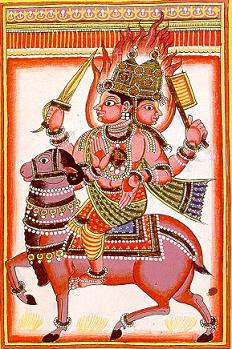 With Varuna and Indra he is one of the supreme gods in the Rig Veda. The link between heaven and earth, the deities and the humans, he is associated with Vedic sacrifice, taking offerings to the other world in his fire. In Hinduism, his vehicle is the ram. ***** . Katen　火天　the God of Fire .